Step 1. Preheat oven to 180°C. Thinly slice one of the bananas. Heat the butter in a medium frying pan over high heat until foaming. Add the banana slices and cook for 30 seconds or until golden brown. Remove from heat. Place banana slices in the base a of each silicon mould. Step 2. Use a fork to mash the remaining bananas until smooth. Add the boiling water and bicarbonate of soda – stir to combine. Set aside to cool slightly. Step 3. Place the banana mixture, extra butter, sugar, eggs and flour in the bowl of a food processor and process until just combined. Pour evenly among the silicon moulds. Bake for 30 minutes. Cinnamon custard: buy from shop OR combine milk and cinnamon in a small saucepan over medium heat. Step 4. Bring to a simmer (do not boil). Combine the flour, sugar and egg yolks in a heatproof bowl. While whisking, gradually add the hot milk. Whisk until smooth. Pour into a saucepan, place over low heat. Cook, stirring, for 5 minutes or until custard thickens and coats the back of a wooden spoon. Step 5. Turn the puddings onto serving plates. 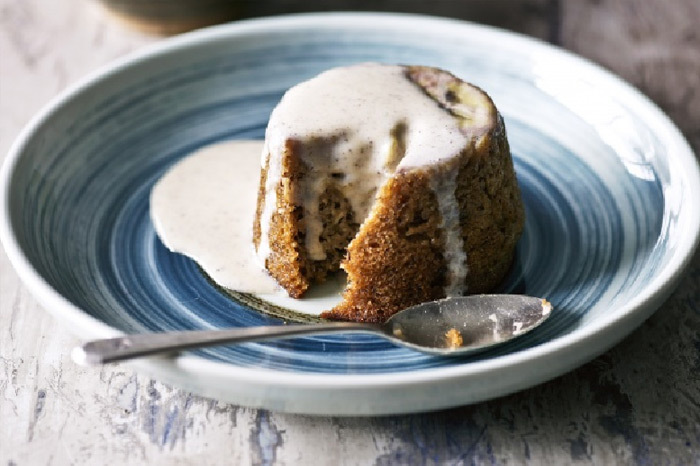 Serve immediately with custard.